A climber who fell down a 35 ft cliff was taken to hospital by Coastguard helicopter on Sunday 25 May. Portland Coastguard received a 999 call from a member of the public using the emergency telephone at Anvil Point Lighthouse to report a climber in difficulties over the cliff at Marmolata Buttress. The climbers had requested an ambulance but no further information was available. In view of the 35 metre height of the cliff, the Coastguard rescue helicopter was scrambled, Swanage RNLI Lifeboat launched and the Swanage Coastguard Rescue Team sent to the scene. When the teams arrived on scene, it was established that one of the climbers had suffered a fall and a suspected broken rib. He was therefore unable to climb back up the cliff. The Coastguard rescue helicopter, after preparing the casualty, airlifted him to the Poole Hospital landing site to be met by Poole coastguard rescue officers and ambulance for onward transportation to Poole Hospital. Swanage Lifeboat recovered their crewman who had also attended the casualty. Swanage Coastguards monitored a further three climbers until they were safely back at the top of the cliff. In this particular area, there is little or no mobile phone coverage. 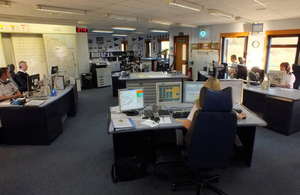 In areas like this it is advisable to have another means of raising the alarm, for example an additional person, not involved in the climbing activity, who could immediately inform the Coastguard of an incident.